Streamlined and unobtrusive, CueType launches in a flash and lets you get right to work honing your keyboarding skills. Squeeze in a little practice when you have a few minutes to spare, and make the most of your time by taking complete control of your progress. CueType’s drills are progressive, but there is no requirement to try them in order. With the convenient Drills Drawer, you can easily switch to any drill at any time, attempting it as often or as seldom as you like. Feel perfectly free to jump ahead and challenge yourself, or to go back and brush up on troublesome keys, or to keep trying a drill until your speed is through the roof and your accuracy is consistently 100%. Do-over! 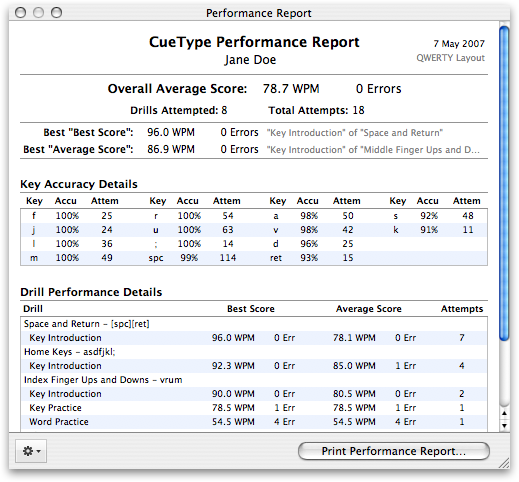 Set speed and accuracy thresholds, and whenever a drill attempt begins to fall short of your standards, CueType will immediately interrupt that attempt and let you start again. By reducing time spent on sub-par attempts, the Auto-Restart helps you achieve greater performance more quickly. CueType marks your mistakes in red, letting you review them when a drill attempt is over. The red marks turn blue on your next attempt, warning you of your previous trouble spots. During a drill attempt, the Keyboard panel highlights the next character to be typed, and indicates keys pressed in error. The Ghost-Type feature runs through a full drill automatically, with the Keyboard panel’s highlighted keys illustrating helpful patterns. Learn the U.S. Standard “QWERTY” or Dvorak keyboards, or learn them both! 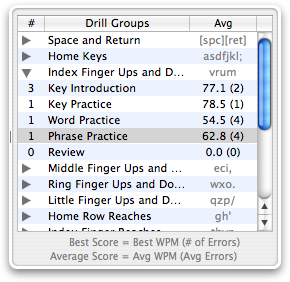 CueType maintains performance records for drills in each layout individually, so you can switch between them at will. Note: Your physical keyboard doesn’t have to match the chosen layout. You can, for instance, learn Dvorak on a QWERTY keyboard (or any other keyboard with the same basic shape). When the goal of learning to touch-type is to avoid looking at the keyboard, it doesn’t matter which characters are printed on which keys! The straightforward Performance Report panel compiles comprehensive drill statistics, including overall average speed and accuracy. While packed with features, CueType remains easy to use, with the familiar Mac look-and-feel. You’ll find the drills in a drawer, important options in a customizable toolbar, and information in retractable sheets. Also, CueType features no long-form, natural-language drills! 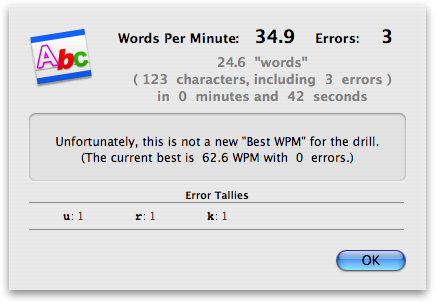 The very best part of the CueType experience is the moment you decide you’re done with it. We want that moment to come as quickly as possible. You have much better things to do with your time; find them. 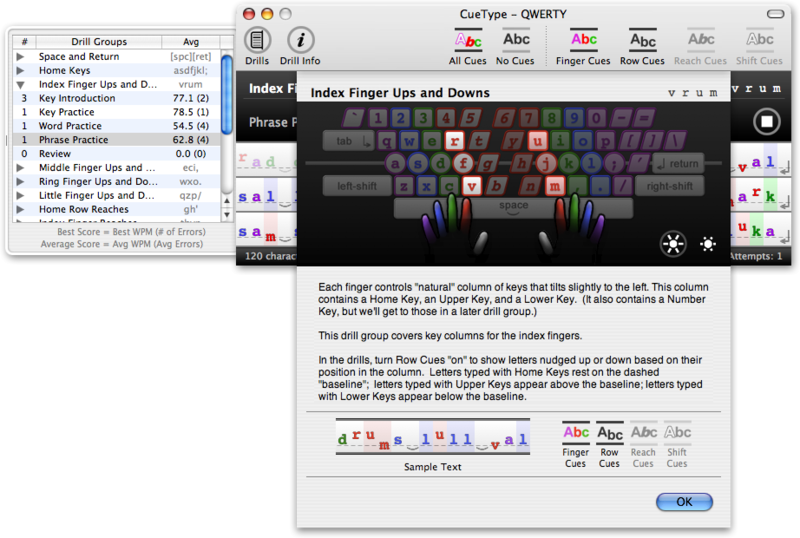 CueType helps you learn to touch-type by reducing the temptation to look at the keyboard. 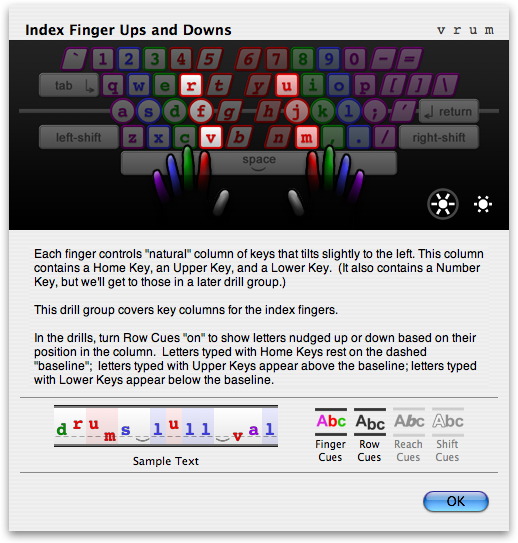 Clever visual cues right in text of the keyboarding drills remind you what to do with your fingers. Finger Cues apply color according to the finger and hand used to type each character. Row Cues raise or lower a character whose key lies above or below the “home” row. Reach Cues slant and thicken a character whose key requires a finger to “reach” to the left or right. Shift Cues outline a character typed with a Shift key. The variety of these visual cues makes CueType unique among keyboarding drillers. *Don’t worry if the “fully-cued” view seems a bit overwhelming: the drills work up to it gradually.